Matt Bond makes it 950,000 preflop with Englert calling. Bond bets out 550,000 on the and Englert again makes the call. The turn is and Bond puts a 7-figure bet out of 1,075,000. Englert starts counting out chips, then takes a full stack and announces "All in," as he slides it forward. 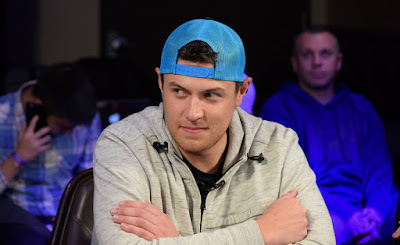 Bond mucks and for the first time heads-up, Englert has a small chiplead of about 4BB, expanding that lead to a 11m-7m lead after a few more hands. Pocket Jacks for Englert one hand later, Bond pays off a big river bet and now the lead is 13m-5m for Englert. While neither player showed any negative emotion most of final table play, Bond seems clearly frustrated now.